1. Zionism/Pan-Zionism: Jewish and Christian Zionism. It was the inspiration behind both modern Zionism which led to the forming of the Jewish State in 1948 through terrorism against the British Mandate as well as Britian and France’s Sykes Pikot betrayal/agreement and the Balfour Declaration. The British Parliament, not monarchy, and the French republic advocate belief in Anglo-Israelism and Franco-Israelism. Christian-Zionism is the dominant political view in Western democracies due to Christian dispensationalism theology , while Jewish-Zionism the trend in the Jewish State. Both groups envision a unique pan-Zionist state under their individual Messiahs (Jesus and the Jewish Messiah) in the Middle East and seek to erase Arab presence totally from the Middle East as they did to the Native Americans in North America. The West’s blind support for Israel fueled by dispensationalism theology of the delusional ‘Christian-right’, and America’s historic demonization of Arabs in Hollywood, continued Gulf Wars and now open arming of terrorists demonstrates this clearly. Both groups advocate a misappropriated and corrupted form of the Arab polygenism theory of pre-Adamism and ironically do not believe Arabs are Adamic peoples, referring to them as pre-Adamic, pre-Adamites. Thus they accordingly refer to Arabs as “savages” and “primitive”, “swinging on trees three-thousand years ago” in their media as they did in the past with other groups and even when sending aid to Syria, prefer Kurds and Turkish origin Syrians to Arabs. Jewish Zionists hate Jesus and are vehemently anti-Christ while the Christian Zionists are vehemently anti-Semitic, hence the migration of European Jews to the Arab Middle East. 2. Islamism/Pan-Islamism: This technically began with the Abbasid revolt against the Umayyad kings with the aid of non-Arab Islamic mercenaries from Khorasan. It developed during the Abbasid era with the evolution of various schools of Fiqh etc., and evolved with the rise of the Ottoman Turks and Ayyubids. Other post-Ottoman and post-Ayyubid forms of pan-Islamism grew into terrorist and other movements like the Ikhwan and Al Qaeda and Daesh. There are both Shia and Sunni versions of this ideology. Today, Iran leads the Shia pan-Islamism front while Pakistan (Afghan war time, Taliban connection/shelter to Al Qaeda etc.,) and more so Turkey under Erdogan now lead the Sunni republic front. The Turks under Erdogan are now infamous for supporting Daesh, and the Muslim Brotherhood among others, but the real leader of pan-Islamism among the Sunni Arabs is in fact none other than the Kingdom of Saudi Arabia. The Sauds did not subscribe to the idea of pan-Arabism, instead they made an agreement with the Ikhwan of Najd, adopted Wahhabism, and have spread pan-Islamism globally since their founding. The Kharijites were the first pan-Islamists. The Deobandis and the Pakistanis became allies with the pan-Islamist Sauds in the past in the East for this agenda. The Pakistanis adopted pan-Islamism after ending their monarchy in 1956 and becoming an “Islamic Republic”, while the pioneers of the Deobandi movement fully merged with pan-Islamism after the complete political and cultural abolishment of the Mughal Empire by the British Raj. Now, even most Sufi minded ulema have turned to pan-Islamism, only with a different interpretation of the faith. Pan-Islamism is no longer exclusive to the Deobandi and neo-Wahhabi Sunnis, rather even Sufi minded Sunni religious leaders have also adopted it, whether knowingly or unknowingly. Following the terrorist attacks of September 11th, 2001, the Sauds started trying to distance themselves from pan-Islamism. However, if the kingdom divorces pan-Islamism, without Arabism, the kingdom is without direction, as we are seeing in its Yemen conflict, and the unwillingness of Saudi soldiers to sacrifice their lives for the House of Saud and not pan-Islamism, could ideologically collapse the kingdom, or make it ripe for the US Christian-Zionist backed, destabilizing ‘Arab Spring’ pro-democracy movements like in other Arab countries of recent. In 2015 the Kingdom of Saudi Arabia, Turkey, and Pakistan decided to move away from pan-Islamism, and this has united the Arab and Islamic world in an unprecedented way never seen before. If Iran breaks free of pan-Islamism, their proxies in Gaza, Lebanon, Iraq, Bahrain, Yemen, Egypt and Sudan will also repent. This will force Qatar to end sympathy for pan-Islamism and could usher in an era of unprecedented power and unity. Likewise, if the Pakistanis accept they and the Northern Indians and specifically also the Brahamins are in fact all Mediterranean by race like all of North Africa, and the Arabs of the Middle East, they will be able to halt support or sheltering of terrorists and pan-Islamist extremists. The Arabs, North Africans, North Indians, (biologically) Semite Israelites native to the Middle East, majority of Iranians and even Pakistanis among others are in fact one single race – Homo Mediterraneus (Mediterranese). In fact, it was a common belief during the Mughal era that Brahmins at least, are Ahl al-Kitab, given they posses Divine Scripture which teaches Monism, mathematics, science, cleanliness, ethics, medicine, evolution, astronomy and architecture. 3. Arabism/Pan-Arabism: Technically part of the Prophetic mission and rise of the religion Islam itself, given the first Muslims and first members of the “Ummah” or nation (“Khayra Ummatin”) were the Children of Ishmael, or Arabs. Early Islam was predicated upon the central idea that the Covenant of Abraham was fulfilled in Ishmael and his descendants the Arabs, the nobles from among whom were the Lords of the Quraysh (Sadaat Quraysh), who would later claim divine right at the Saqifah. Individual conversions among the first generation like that of Bilal the Ethiopian or Salman the Persian cannot be counted as a nation for obvious reasons. With the end of the Abbasid caliphate in 1258, and the rise of the non-Arab Turks who created the Ottoman Empire and claimed the caliphate in 1519, pan-Arabism was replaced by pan-Islamism. With the fall of the Ottoman Empire in 1924, Sharif Hussein revived pan-Arabism and established a pan-Arab caliphate, one borderless Arab kingdom, which included Makkah, Madinah, the entire Hejaz, Al Aqsa, Syria, Lebanon, and all of the holy sites in Najaf, Karbala, Kazimiyya, Askariyya, Baghdad, and the whole of Iraq, all united under one descendant of the Prophet, who was also the declared King of the Arabs and Caliph. 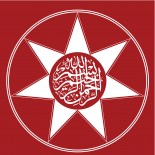 The British and French Christian Zionists deemed Sharif Hussein a greater threat than the Zionist terrorists who wanted a Jewish State and were attacking the British Mandate with terrorism, so they sided with the Jewish Zionists, gave them a state, and have covertly financed and armed pan-Islamism throughout the Arab and Muslim world since. Following this, the pan-Arab kingdom vision of Sharif Hussein was lost in history. Sharif Hussein’s pan-Arabism was based on a model of a religiously backed monarchy and Arab caliphate. In order to further erase from the memory of the Arabs the lure of Sharif Hussein’s idea, Russian communists gradually entered the Middle East. A new breed of communist backed pan-Arabism was created, which disregarded Islam, traditional Arab culture, monarchy and the caliphate all together. The leaders of this version of Arab nationalism were all dictators. Nasser of Egypt, Saddam Hussein and his predecessors of Iraq, Qaddafi of Libya, and the leaders of most non-monarchy Arab republics come into this category. Their actions and disregard of Arab religious sentiment resulted in the unprecedented and phenomenal rise of the pan-Islamist terror movement Daesh in the region. An analysis of the spectrum of Muslim political opinions among in the West and abroad. 11. Nothing. Apolitical. According to Pew Forum on Religion and Public Life, over 670 million Muslims expect Mahdi and Jesus to appear before 2050. 12. Aspiring Jihadist / Terrorist. 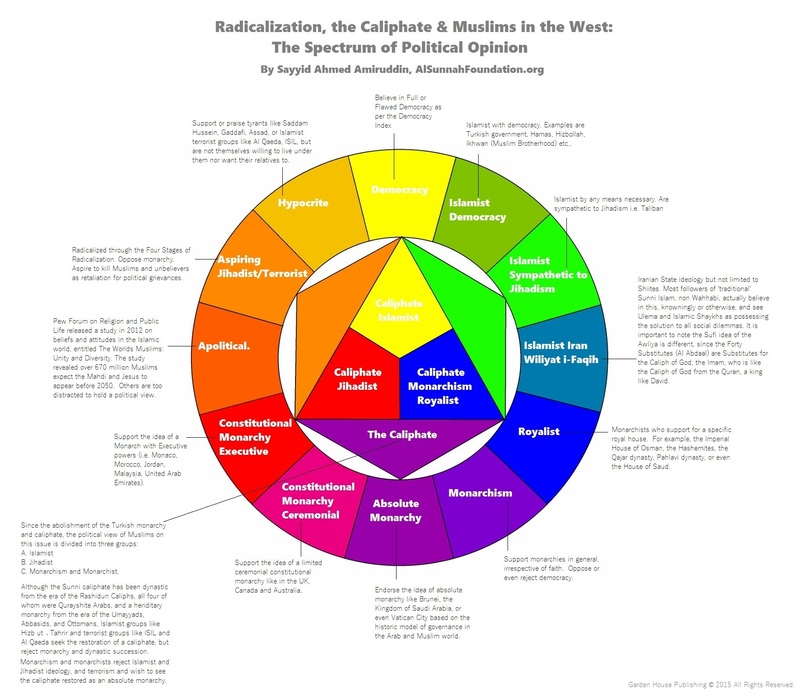 Radicalized through the ‘Four Stages of Radicalization’. 13. Mindless. Believe in whatever the mainstream political philosophy of the country they reside in adheres to. If American, full democracy, if Canadian, ceremonial constitutional monarchy, etc.,. 14. Hypocrite. Support or praise tyrants like Saddam Hussein, Gaddafi, Assad, Mubarak, or Islamist-terrorist groups like Al Qaeda, Taliban, Daesh, etc., but are not themselves willing to live under them nor want their relatives to. There is nothing else. This makes so much sense. Thank you very much for writing this article. No doubt it has been thoroughly researched and well explained. This entry was posted on December 3, 2015 by ASFC in Uncategorized and tagged Christian, Jewish, Middle East, Nationalism, Nationalists, pan-Arabism, Pan-Islamism, Sayyid Ahmed Amiruddin, Shaykh Nazim Adil al-Haqqani, zionism.